The Sierra de Ameca is a range of hills a short distance west of Guadalajara. The area was important in colonial times for gold and silver mining. One of the mines is called Piedra Bola (Stone Ball). The landscape immediately around this mine is so distinctive and unusual that it featured on the cover of the August 1969 edition of National Geographic. 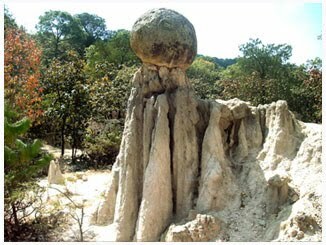 In the middle of the forest surrounding the Piedra Bola mine are about a hundred strange stone balls. They are almost perfectly spherical and range in diameter from about sixty centimeters to more than ten meters. These symmetrical boulders are unusually large. Nothing quite like them exists elsewhere in Mexico and few similar examples are known anywhere in the world. Some are buried, others partly or fully exposed. In some places, erosion of the surrounding rocks has left a sphere perched precariously atop narrow columns of softer rock, seemingly ready to topple in the next strong wind. These “hoodoos” or earth pillars have been formed as a result of water erosion and they may survive for centuries until the processes of sub-aerial weathering and erosion finally cause them to fall. How were the Piedras Bola formed? This summary of the most likely explanation of the origin of the stone spheres is based on that offered by Dr. Robert Smith of the U.S. Geological Survey in the original National Geographic article. During the Tertiary geological era, 10-12 million years ago, a local volcano erupted, causing a deluge of glassy fragments of molten lava and ash, together with large quantities of volcanic gas trapped in the mixture. The mixture was very hot, probably between 550 and 800̊C. The deluge of material partially filled an existing valley, burying the former surface. As the mixture cooled down, the existing glassy fragments formed nuclei around which much of the remainder of the material crystallized. Spherical balls began to form, their size depending on how long the crystallization process continued uninterrupted. The longer the time, the bigger the ball…. The most perfect balls were formed near the previous ground level, inside the hot mass of ashes, where the cooling would have occurred more evenly than in the bulk of the matrix material. The crystallized material is a kind of rhyolite which has an identical chemical composition to the fragments of glassy obsidian also found in the area. The remainder of the ashes cooled down and became a consolidated accumulation of ashes and glassy fragments or tuff, without clearly defined spheres. This tuff is weaker, and has a lower density than the stone balls within it. During succeeding millenia, the combined processes of physical and chemical weathering weakened the surrounding tuff, and water (rain and rivulets) then eroded away this loose material, exposing some of the rhyolitic boulders completely and others partially. As these processes continue, so more of the boulders will be exhumed from beneath their cover of tuff, and be revealed to us. The Jalisco State government has developed a small park around the Piedras Bola, including decent trails, some signposts and an amphitheater. There are even (reportedly) two ziplines, though I haven’t yet had the dubious pleasure of seeing them for myself. Increasing the number of visitors to geomorphosites is not a bad idea, but some basic education and protection is needed if these and other geomorphological sites are going to be preserved intact for future generations. In the case of the Piedras Bola, graffiti now mar many of the exposed stone spheres and some of the spheres have been dynamited, apparently in the mistaken belief that the center of the sphere contained gold. The entrance road to the Piedras Bola (formerly only a hiking trail) begins from km. 13 of the paved road that crosses the mountains from Ahualulco to Ameca. 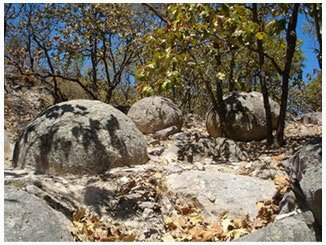 For anyone who does not have time for the hike, but still wants to see what these extraordinary stone spheres look like, the locals have thoughtfully rolled one down the mountain and onto Ahualulco’s main plaza. 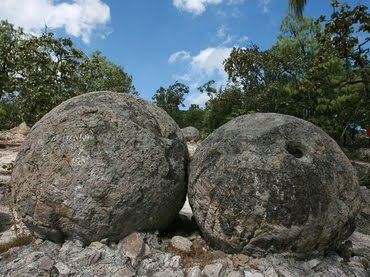 For more images and details, see John Pint’s article, Las Piedras Bola: the great stone balls of Ahualulco, on MexConnect, together with his outstanding gallery of photos.